Big Shoals Here We Come!!! 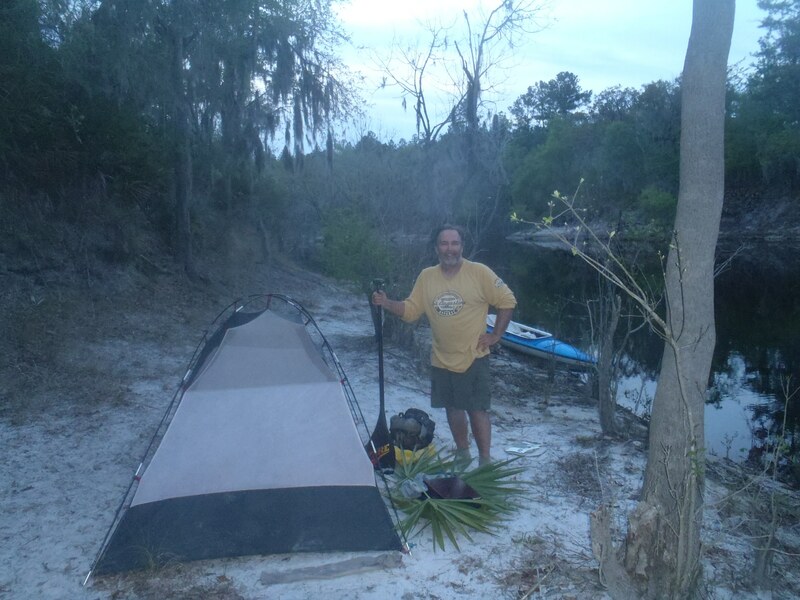 Instead of waking up thinking I was asleep on an aircraft carrier, I woke up thinking how pleasant and peaceful it was to be in the woods camping by the Suwannee river. 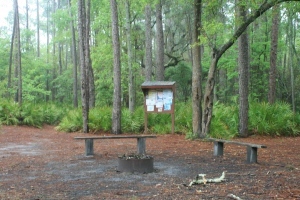 The campsite was extremely nice. Firm sand, no roots pushing into my back, no bugs, no wet fog, and an air temperature that wasn’t too cool, but cool enough to make it very comfortable inside the sleeping bag. As I crawled out of my tent I had to smile. No wind in the face, the current was flowing in the direction we were going and it was so quiet. That was until Rod woke up or should I say until Rod tried to get out of his tent. OUCH!!! Moan!!! OUCH!!! Moan!!! Oh no, I am falling!!! Bam. Even though Rod was able to be off his feet for part of the previous day his feet were still pretty messed up. Rod, being the problem solver that he is, got his paddle and started using it as a crutch. It worked pretty well for him. I am glad that Rod has the sense of humor he does because he sounded and looked like an 80-year-old man when he tried to walk and I would start laughing. Thankfully, he would laugh too. He was being a real trooper and I knew with each day his feet would get better if he could keep them from getting infected. As we pushed off I started to think about the fact that we would be facing Big and Little Shoals rapids today. In planning for the UFC, there was so much concern about the water levels being low that I figured I was going to have to drag my boat over the rocks at Big Shoals. I really had not thought that much about running the rapids. Now with so much water in the river that was the big question of the day. But that decision was several hours away and why ruin the early morning calm and beauty worrying about that. The river was so peaceful and the scenery was so beautiful. I started to realize why Rod likes river paddling so much. You don’t have to worry that much about navigation, if the weather gets messy you just head to the river bank, no waves, and lots to look at. I could get used to this. So for several hours we just enjoyed the river. About an hour out from Big Shoals Rod started to talk about running Big Shoals. For Rod, he had done it before and felt very confident he could. For me, not so much. I knew I could control my boat down the face of a large wave, but rapids? Hmmmm I didn’t know. I mean what makes rapids is big rocks underwater which means more than controlling your boat down a wave. All I could think about was flipping, losing gear, busting my rudder or getting a hole in my boat or even worse, hitting my head on a rock. We had come this far, why risk having an event that would knock us out of the race. There was a portage path around the rapids that was about a quarter of a mile in length. To me that was the path to go. Rod, on the other hand, was so confident in running the rapids and this would save a couple of hours of time and keep him off his feet. Up to this point we had alway came to a pretty quick decision on a course of action. Not this time. In fact, we were still in disagreement up to about a quarter of a mile from the take out for the portage. Here we came across a group of kayakers that of course Rod had to talk to. You know, Mr. social butterfly. Well, in that discussion we learned about a guy who had gotten hurt the day before trying to run them. The individual sharing this information ended the conversation with a strong word of caution and a warning that we better have helmets if we are going to run the rapids. That was all I needed to hear. We might have hard heads but neither of us have helmets. “Rod, if you want to run them, go ahead. I am doing the portage and I will catch up with you later. 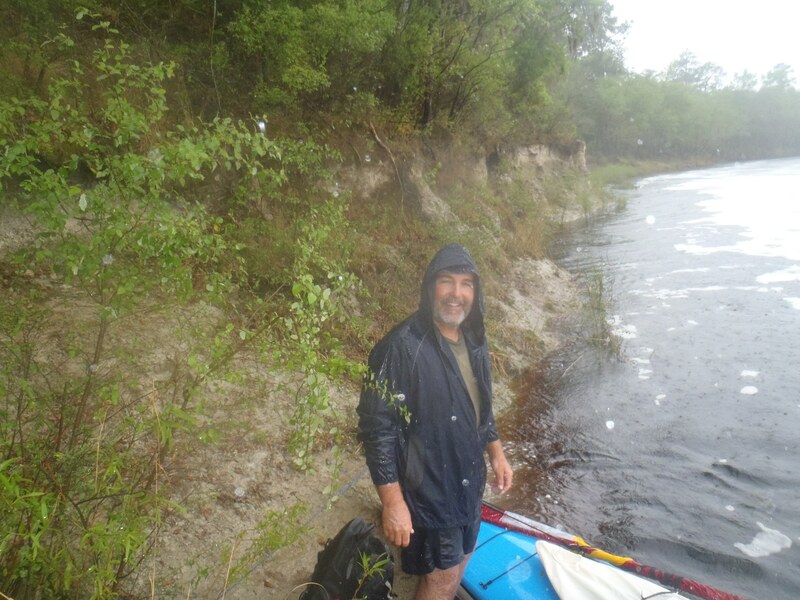 Decision made for me.” Reluctantly Rod decided not to run the rapids and deal with the pain and uncomfort of the portage. In looking back on this, I still think we made the right decision, but the portage was tough. 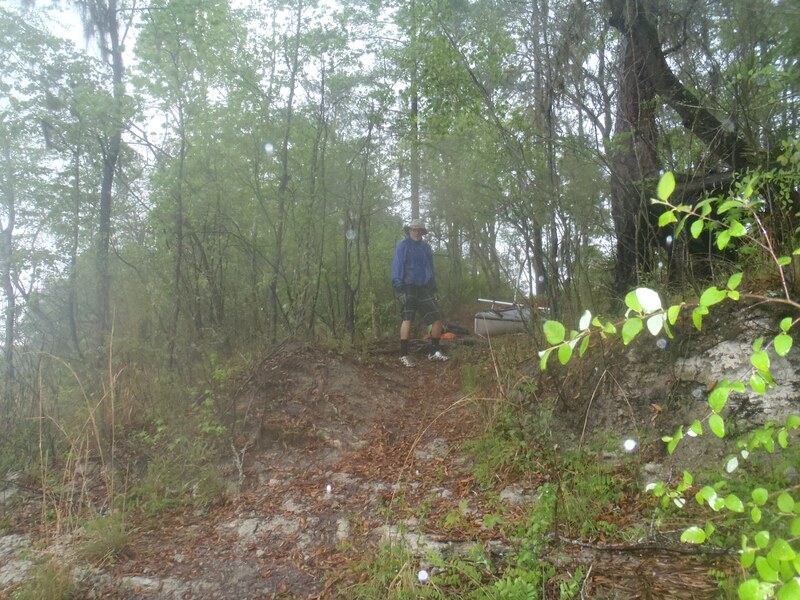 What made it tough was the steep bank we had to drag our boats up, and then down, then dragging our boats over this trail with tree roots, in the middle of a thunderstorm, through a bunch of tall pine tress, and then having to make multiple trips to move our gear that had to be unpacked and repacked into the boats. I never thought of this section of the river as dangerous but I guess that was a mis-perception for me. I say this because as Rod and I were moving our gear from the take out point of the portage, a couple in a canoe pulled up. They were also going to do the portage. At one point, Rod says to me, “Hey, did you notice the pistol that guy has around his waist?” Well on my way back I passed them at the halfway point of the portage and sure enough the guy had a .45 cal automatic pistol in a holster around his waist. Hmmm, don’t think we will be hanging around here any longer than necessary. 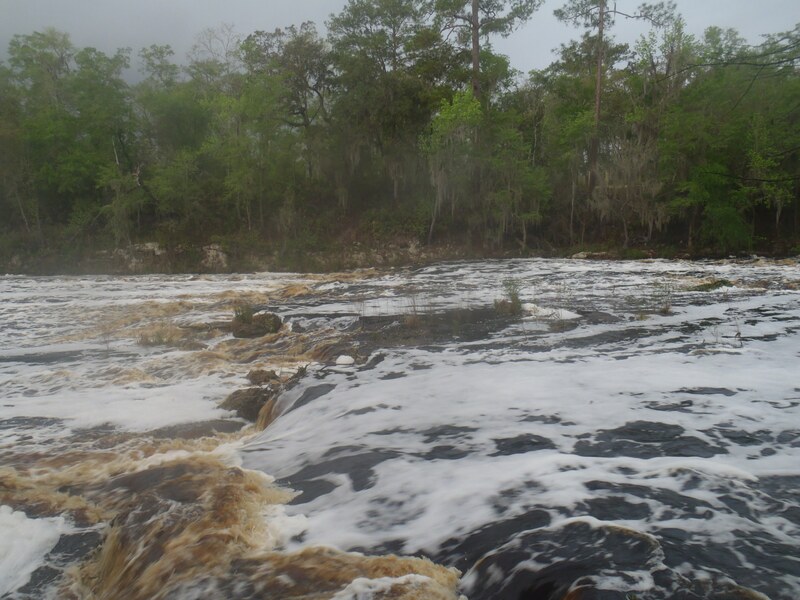 Lightening, .45 cal pistols, rapids with big rocks……. what an adventure. 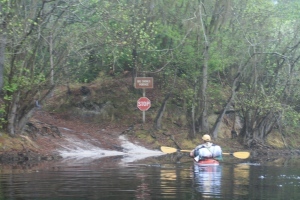 We completed the portage and were off to face little shoals. Thankfully these were not that bad and I just followed the line Rod set through them. The rest of the day was pretty non eventful and very enjoyable. We ended up camping on another sand bank. It had the same characteristics of the campsite we were at the night before. As I went to sleep that night, I couldn’t help but think that river paddling is pretty nice. That is, if you don’t have any rapids to deal with. 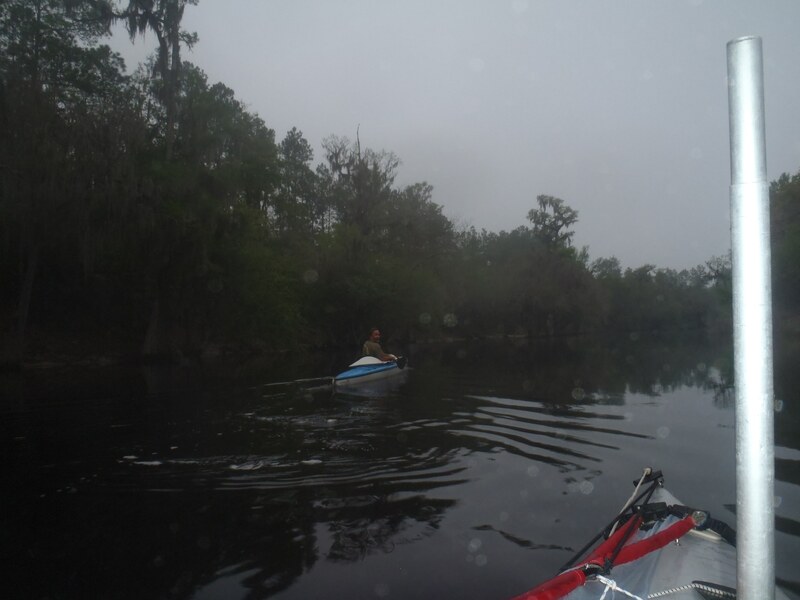 Hey Bill, I agree with you on the river paddling versus open water, nice looking at the surroundings and enjoying the peacefulness.